Please only post bugs regarding Cathedral of Eternal Night. If you want to confirm a bug that is already posted please just use - like - button, otherwise we will delete your post. When reporting a bug please use the template at the end of this post. [PENDING]Helblaze Felbringer - Burning Celerity debuff does not always get removed after walking out of the AOE/bubble on the ground. We are aware of the general texture problems, LoS, some AoE abilities pulling mobs from the upper part of the dungeon etc. When you are adding an image or a video to your report as proof please use the [spoiler] feature. Burning Celerity https://www.wow-freakz.com/spells.php?spell=Burning+Celerity doesnt remove when you leave the void or when it despawns. Leads to death. Check the video above at 03:08. Here Dark Soltitude still hits like crazy. 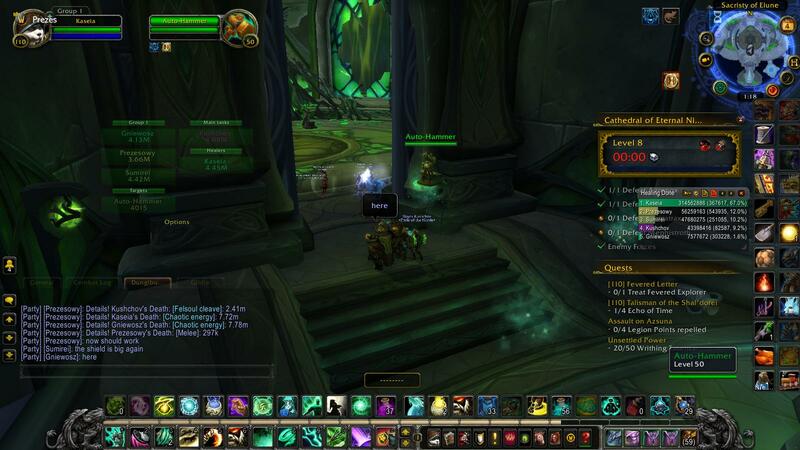 Choking vines https://www.wowhead.com/spell=238593/choking-vines should have a delay when they are pulling you, right now they don t, making the damage quite unsurvivable. At the moment she randomly cast (instant sometimes) her ability to random locations without any kind of tp or delay. You should be able to outrange/los Gazerax's blinding glare. At the moment not working, also there is no cast time right now. Bug description: Feral's skull bash makes you fall under the floor. Bug description: Hellblaze Temptress' Alluring Aroma makes you fall under the floor. Within the helblaze imps pack, there will be a couple of Wyrmtongue Scavangers. These will throw different books with certain abilities at the location of the players. The expanding-silence book acts when it spawns like it is already fully extended silencing everyone in 30y circle range. Visually it s working but it still silences you even though you are not in the pool. !!! On our server they are spawning double-triple as much, also more often than it should. Bug description: Using charge on dungeon have a chance to make you fall under the ground. Bug description: when lashers spawned , you should kill them as fast as possible, but you cant ,every hit or spell you just see "Evade" on them. Mini-boss before 2nd boss(Gazerax) usually causes unavoidable wipes because it does not cast Blinding Glare, but dmg happens. This is a serious problem since this should be easily avoided by turning to somewhere else than mini boss. Currently boss only casts its general dmging spell Fel Glare. Mini boss before Gazerax still casts his huge damage aoe instantly. Portal guardians on 3rd boss are stunnable leading to infernal warbringers not spawning. Bug description: After the first wipe on the boss, the Aegis will start losing "Aegis Power" before the fight would even begin, depleting it by the time we need it, making the fight impossible. just making a clean report in the right form, the issue is the same as the post above this. Bug description: Fps drop issue caused after Dul'zak casts Shadow Wave. In it's shadow phase, where tanks supposed to def npc orbs seems to have the same problem as in HoV(Odyn). This can be seen from that a lot of orb simplely goes through the shield(it does not acutally, since those are fake orbs) while sometimes orbs randomly appear and break on the shield. Quite problematic cause not only harder to def npc but dps alsp cannot dodge orbs since they also see only fake ones.